Reich Angus Ranch is owned and operated by Harold and Dorothy�Reich�along with their family, Kolton�& Bailey, Brent, Damian�& Jennifer. Our goal is to provide our customers with top performing animals. From Angus Cattle to Quarter Horses we take pride in producing quality products for our clients. 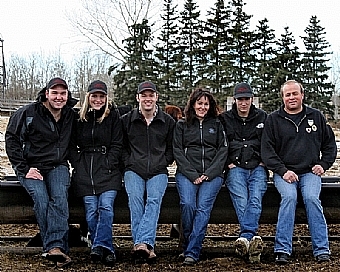 Reich Ranch has been in the business of raising�Angus Cattle for almost 60 years. In�the early 1950"s Harolds parents, Gotthold and Irmgard Reich, under the farm name of "Green Vale"�purchased a set of Aberdeen Angus Heifers. Four years later the first Reich Angus Bulls were sold at the Calgary Bull Sale. 1969 marked the beginning of a long and lucrative show career for the Reich family and Greenvale Farms. �December of 1995 Harold joined forces with Rob Hamilton and together they held their first annual yearling bull Sale at Hamilton Ranch.